The preschool years can be a wonderful time for traveling, especially compared to the toddler years. At ages three and up, kids are typically talking, inquisitive, and can absorb a great deal about new people and places. They can sit still for longer periods as they get older and may be less prone to tantrums (though we're still waiting for those to disappear entirely). You get the added bonus that they can now carry some of their own stuff. At age 4, you are no longer required to carry a carseat onto the plane. The downside is that children at this age often can't sit still for very long stretches, need entertainment, and when bored will pepper you and others with questions like, "Are we there yet?" "When are we going to get there?" "Is THAT our hotel?" "How many minutes until we get there?" "This is soooo booooring." These questions generally all come in a constant barrage and can wear the nerves of the most patient parent. If you're lucky, they won't be delivered as a perpetual whine. If not, carry earplugs, just in case. Short of retreating into meditation recordings on your iPod, there are some things you can do to make the trip more enjoyable for you and your child. With a little planning, the trip can be nearly as much fun as the destination. If your child is potty training, you might want to invest in a foldable child’s toilet seat cover if the child is afraid of falling in. Be sure to go to the potty immediately before boarding and prior to descent, to avoid accidents during times when you cannot move around the plane and make it to the bathroom. Make sure your child is dressed comfortably, in loose-fitting, breathable clothes. Sweatpants or shorts with elastic waistbands are easier to get off in a potty emergency, and more confortable than jeans. Bring along extra pants and underwear for possible potty accidents, and plastic bags to carry the messy clothes in. Keep an extra shirt in your carry-on for potential spills. Favorite toys, blankets, teddy bears or other reminders of home. Your child can pack these in his or her own rolling suitcase. Check out the cool Kid's Car Suitcase , a hardsided rolling suitcase that kids can use as a pushcar when stuck in the airport. A few new toys, coloring books, crayons, and paper to dole out along the way. I carry a small notebook and kept track of "Good Traveler Points." When my son uses his good manners, sits in his seat with his seatbelt on, helps others, and does other nice things, he scores points. At 20 points, he gets to choose a wrapped prize (usually a book, deck of cards, small toy, or pad of paper/crayons). As he has gotten older, the points have become harder to earn. He has become quite a skilled negotiator, and often tries to bargain for additional points ahead of time. Books, magazines, and DVDs on the place you are visiting. Reading or watching these before you leave and on the plane can help ease fears of a new place, and build excitement. 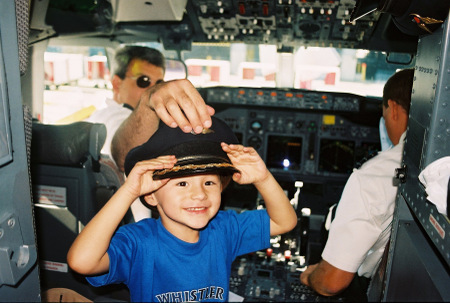 Discuss your itinerary with your child and engage his natural curiosity. "Do you think we'll see a manatee when we get to Florida? What do you think it will look like?" Use your imagination. Play a game of "You Tell the Story" by starting a story set in the place you are visiting. Pass the story around to everyone traveling with you. You never know where it will end up. Preschoolers might add a few words, or an entire dramatic recitation. You can take a few notes and write it down later. 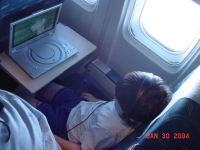 Older children might enjoy hearing or reading chapter books on long flights, or it might be a good sleep-inducer. I think we’ve read the first chapter of Harry Potter and the Sorcerer's Stone about half a dozen times to our son—that seems to put him to sleep faster than Benadryl! Many longer books are available on tape, and can be great distractions on long flights. Language tapes, mp3 audio files, or DVDs: if you are traveling to a non-English speaking country, see if your child is interested in learning a little of the language. Your child can charm the locals just by knowing how to say, “please” “thank you” and “excuse me” in their language. You probably never realized how much your child was absorbing from Dora the Explorer until you hear her spontaneously say, "Gracias, mi amigo!" Alex had fun with the Earworms Rapid Language series and can now say, "I would like coffee with milk, please" in three languages. He's not old enough to drink coffee, but just in case I'm incapacitated, he can now order it for me in French, Spanish and Italian. On to Japanese! Snacks & Drinks: Crackers, string cheese, mini-carrots, dried fruit, trail mix, and small Power Bars are some choices to have on hand. Candy, cookies, sodas and other treats might cheer them up momentarily, but when the sugar wears off, the crash will not be fun. A Notebook or Journal: Ask your child to tell you a story about where you are going, what they want to do there and what it will be like on the way there and record it. Ask them to tell a story about what they saw there and record it on the way back. When you get there, ask your child to draw the things they saw and did. This can become a wonderful scrapbook of their trips. At this age, kids need to move. Many airports have great play areas for kids to climb and explore. For example, at Chicago O’Hare, the Children’s Museum has a wonderful climbing structure and “mini-airport” complete with jumbo jet and control tower that kids can explore. Check the Airport Map to see where children’s play areas are or ask at the Information Desk. Or, just find an unused hallway or gate area and let them run for a while. For a list of some of the best airport children's play areas, check out this article by Harriett Baskas, author of Stuck at the Airport. If your child is a train lover like ours, it may be enough just to ride the inter-terminal train around the airport if you have a long layover. We're partial to the trains at Dallas-Fort Worth and Minneapolis-St. Paul. Alex is thrilled by sitting in front car window of the automated trains and watching the tracks and the tunnel entrances. The trains are normally free, and you can ride around for hours if you want to. The old train at DFW was similar to riding Mr. Toad's Wild ride at Disneyland, but the new Skylink seems to be much gentler on the stomach and the nerves. Just as when you're traveling with infants or toddlers, the key to traveling with preschoolers (or children of any age) is to relax, plan ahead, and keep your sense of humor with you. Be flexible and know when you and your child have had enough. Let your child take the lead sometimes, and you never know where you'll end up. You'll find the world to be a much friendlier, more hospitable place when you have a cute kid in tow. The world awaits you! What are you waiting for? Got tips or questions? Leave them in the comments!